Delamotte Brut NV is the house’s take on the ‘classic’ non-vintage Champagne. 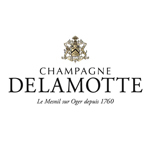 The relatively high proportion of Chardonnay (50%) befits a specialist Blanc de Blancs house and is crucial to the defining elegance of the Delamotte house style. For softness and richness, Delamotte blends in a proportion of Pinot Noir (30%) and fruit-forward Pinot Meunier (20%), in the tradition of Champagne non-vintage cuvées. The Chardonnay grapes are sourced from grand cru vineyards in Champagne’s top villages of Le Mesnil-sur-Oger, Avize and Oger. The Pinot Noir grapes are also from grand cruvineyards in Bouzy, Tours-sur-Marne and Ambonnay. The Pinot Meunier grapes are sourced from high quality vineyards in the Marne. Delamotte Brut NV is bottle-aged on its lees for 3 years, a key factor to its style and quality – it is worth noting that most Brut NV Champagnes spend just 15 months on the lees, the legal minimum in Champagne.